Dubrovnik is an historic, walled town near the southernmost tip of Croatia. The town can trace its roots back to the 7th century AD and at its pinnacle in the 15th and 16th centuries, Dubrovnik rivalled Venice in terms of trade and wealth. These days, Dubrovnik (map) is a popular destination for travellers from around the world who come to admire its historic monuments and wander around its maze of atmospheric lanes. 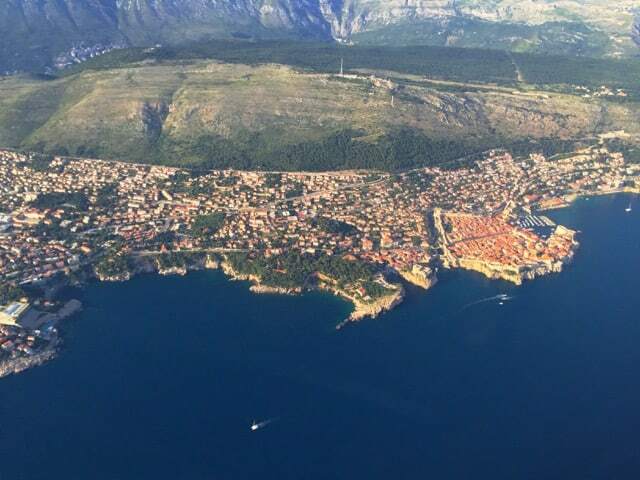 On my recent trip there, the plane (from Amsterdam) flew past Croatia’s Dalmatian coastline, with its many islands, cliffs, inlets and bays, before landing in Dubrovnik. I sat on the left side of the plane (row ‘A’) and the plane window view of Dubrovnik was simply phenomenal! 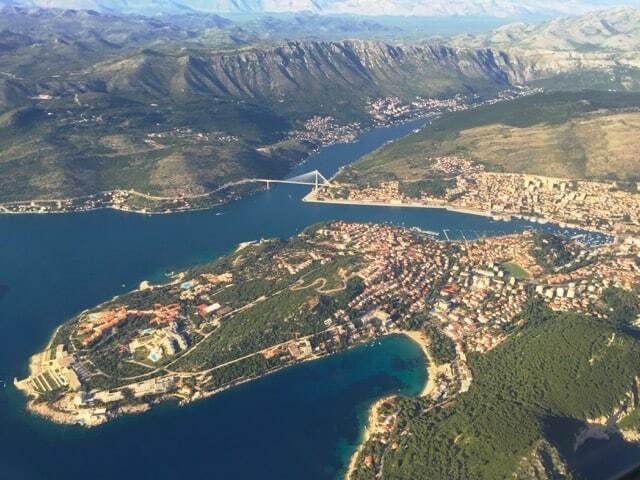 The plane flew past the town of Neum, which is the only seaside town in and main maritime access point for Bosnia-Herzegovina on the country’s 20km Adriatic coastline, north of Dubrovnik. 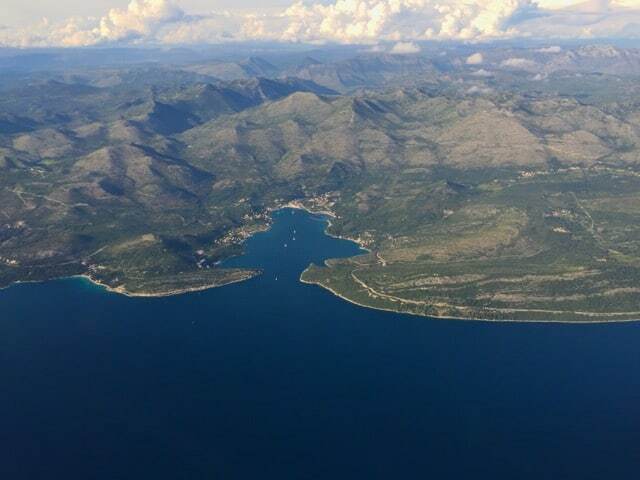 On the approach into Dubrovnik, the plane flew along the Dalmatian coast with its mountains, cliffs and many bays and inlets. The small town at the far end of this bay is Slano. The suburbs of Dubrovnik soon came into view. The area behind the little beach and cove is the suburb of Lapad. In the middle-right of the photo is the suburb of Gruz, with its deep harbour – this is where all cruise ships and ferries to Italy and the neighbouring islands arrive/depart. The historic Old Town with its imposing walls soon came into view. At the base of the communications tower atop the mountain is a viewpoint (you can get there by cable-car, or you can hike, or drive) with arguably the most spectacular views of Dubrovnik. 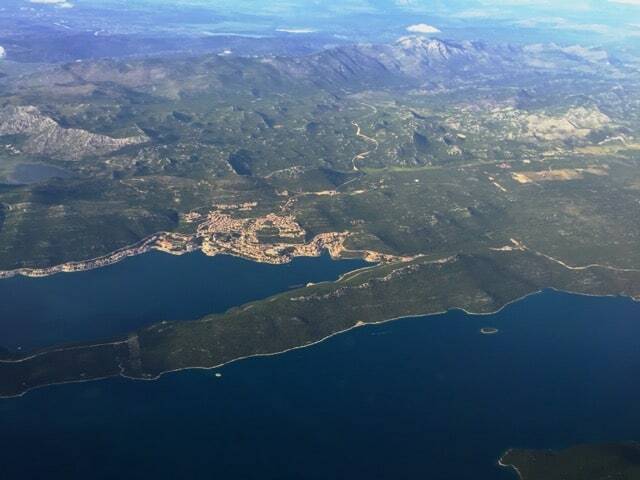 The spectacular aerial view of Dubrovnik from my plane window! 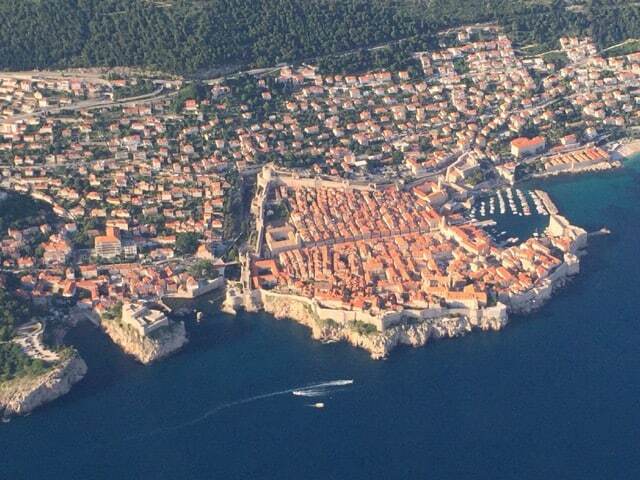 An aerial view of Dubrovnik – the walls can clearly be seen encircling the Old Town. The view of Dubrovnik from the mountain top. Search for hotels in Dubrovnik. So nice blog for Dubrovnik travel. I think this blog is much better than other travel blogs. If you’re arriving by bus, make sure you take the cable-car for amazing views of Dubrovnik! I can only imagine flying into this classic city … I’ll probably arrive by bus when I travel Europe next summer! Incredibly lovely shots you have taken and a very nice blog, I really love the way you are showing and telling us about Dubrovnik.